Professor Ben Feringa has won the 2016 Nobel Prize in Chemistry. Feringa receives the prize together with Jean-Pierre Sauvage (France) and Sir James Fraser Stoddart (UK) for their work on the development of molecular machines. Feringa has been a Professor of Chemistry at the University of Groningen since 1988 and his 1999 discovery of the 'molecular motor' -- a light-driven rotary molecular motor -- is widely recognized as a spectacular scientific breakthrough. Feringa has been awarded with many prizes the last few years, among which the Spinoza prize, the 'Dutch Nobel Prize'. As a chemist, Ben Feringa is interested in molecular construction. ‘I am a molecule builder trying to construct smart molecules’, says Feringa. ‘Building a moving molecule is not that difficult in itself, but being able to steer it, have control over it, is a different matter.’ In 1999 Ben Feringa presented the first molecular motor, consisting of a molecule, part of which performed a full rotation under the influence of light and heat. He has designed many different engines since, even including a molecular ‘4-wheel drive’ car . By fixating the engine molecules to a surface, Feringa developed a nano ‘mill park’ in which the mills rotate when exposed to light. And last year he described the world’s first symmetrical molecular engine . Feringa also succeeded in putting these molecular engines to work, having them turn a glass cylinder 10,000 times their size. Feringa is internationally recognized as a pioneer in the field of molecular engines, as the many citations in a background article on nano engines in Nature confirm. One of the potential applications of his engines is the delivery of medication inside the human body. Besides molecular engines, Feringa is also involved in catalysis and smart medication that can, for instance, be turned on and off by light. Fifteen minutes after the announcement, the hallway on the second floor leading to Ben Feringa's office is crammed with people. It looks like the entire department is there, most of them with broad grins on their faces. As of today they officially work for a Nobel Prize laureate. One who seems to be taking his time, for that matter. He is still on the phone with journalists gathered at the announcement in Stockholm. As the excitement in the hallway grows to a roar, people start hissing: ‘hush!’, not least because they want to hear what Feringa has to say via the Nobel website on their smartphones. Then Feringa appears amid loud cheers and applause. Professor emeritus in Chemistry Jan Engberts, the Nestor of the department, congratulates him in his address: ‘We had all been hoping for this to happen, and now our hopes have become reality.’ Then Feringa addresses the crowd. ‘I am deeply honoured’, he says to his international team, emotion audible in his voice. ‘This is all thanks to the hard work of all you smart students and staff here. Thank you. And I hope this will help you in your future careers too.’ Then the door closes again; the phones can't wait. Klaas Poelstra,Vice Dean of the Faculty of Science and Engineering (formerly known as the Faculty of Mathematics and Natural Sciences) at the UG is ‘incredibly proud’ of Feringa. ‘We had half expected it, but it is always a surprise.’ In the hallway outside Feringa's office similar words can be heard; it was no secret that Feringa had a chance. There were rivals, however, and a Nobel Prize can only be shared by a maximum of three people. ‘That is exactly why it has taken so long’, one of his staff members speculates. But here it is now. Ben Feringa (1951) has been a professor of Organic Chemistry since 1988 and is regarded as one of the best scientists of our time, both within the Netherlands and worldwide. His research performance is exceptional. This is mainly due to the many breakthroughs he has achieved in various fields of chemistry, including organic synthesis, catalysis, supramolecular chemistry and nanotechnology; he is generally regarded as one of the world’s most creative and productive chemists. His discovery in 1999 of the ‘molecular motor’, a light-driven rotating molecule and the potential applications of this concept are as numerous as they are spectacular. The idea that molecular motors can transport themselves through the bloodstream in order to deliver drugs to previously unreachable locations in the human body with a high degree of accuracy is particularly inspiring. It is partly thanks to Feringa that the University of Groningen is undisputedly Europe’s number one in the field of chemistry. 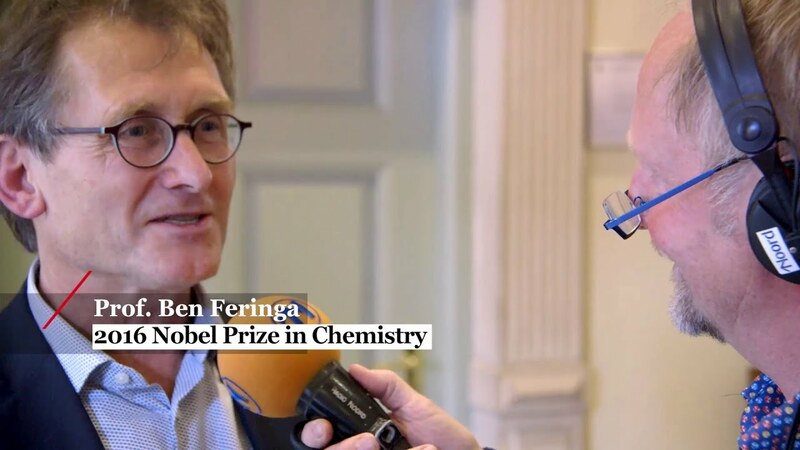 Feringa has been awarded numerous prizes, including the 2004 Spinoza Prize; the highest Dutch prize in science which is awarded by the Netherlands Organisation for Scientific Research (NWO). In 2008 the Royal Netherlands Academy of Arts and Sciences (KNAW) appointed Feringa as the Academy Professor, giving him the opportunity to concentrate on his areas of interest in the field of innovative teaching and research for five years. Feringa also currently holds the post of Vice President of the KNAW. In 2011 he received the Van 't Hoff medal which is awarded once every ten years by the University of Amsterdam for work in the field of chemistry. In May 2013 he was awarded a TOP grant of EUR 780,000 by the Netherlands Organisation for Scientific Research (NWO) to fund his research on molecular motors. In 2013 Feringa was awarded the Lilly European Distinguished Science Award, followed by the Marie Curie Medal, the highest honor awarded annually by the Polish Chemical Society for chemists working outside of Poland. Also in 2013, he was awarded two important Japanese prizes followed by, in 2014, the prestigious Cope Scholar Award of the American Chemical Society. In November 2015 he received the Chemistry for the Future Solvay Prize. Last modified: 03 November 2017 12.37 p.m.